If this boho mama graduated to tony Park Avenue, she’d have a home with décor like the Mark D. Sikes-designed feature in September’s House Beautiful. 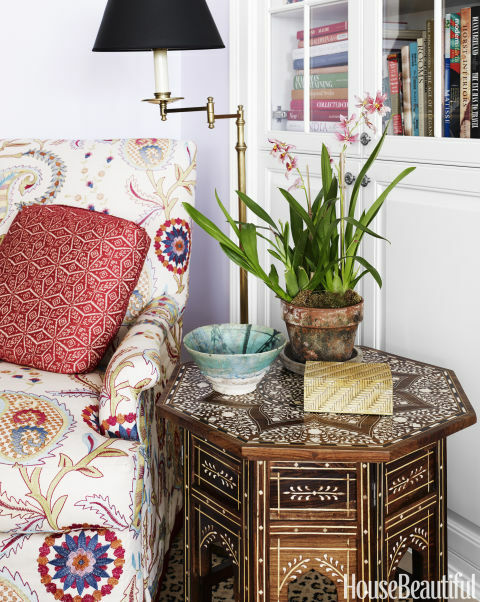 I can’t get enough of the mix of bright colors, ethnic patterns, and textures, all in one connected space. 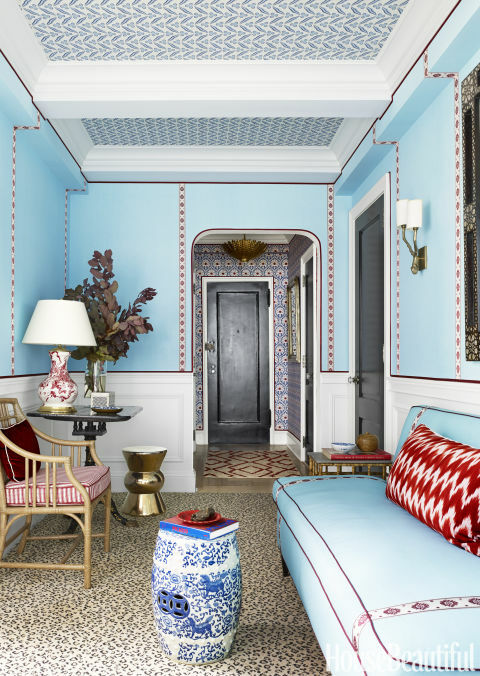 Call it what you will—upscale boho or “glambo” (my personal favorite)—it’s full of old world elegance without being stuffy or formal. The long foyer does double-time as a seating area. Note how the trim on the walls matches that on the sofa. You get a better view of it in this shot. It not only matches, it lines up, like a bespoke garment! 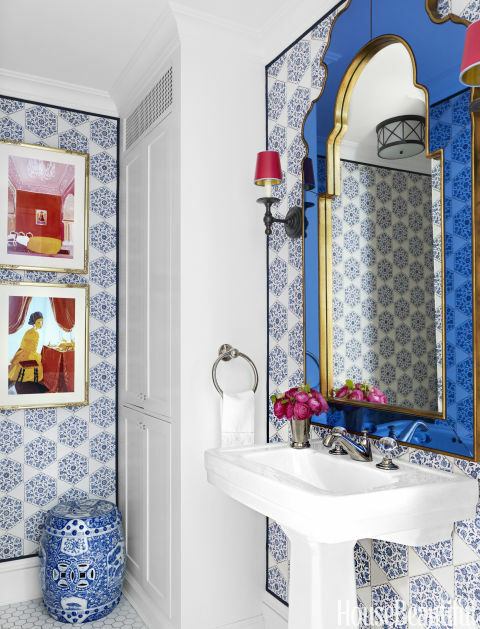 Don’t miss the extra dash of pattern in the wallpapered ceiling and the jaguar-print carpet. Here’s that wowza living room again. There’s something about woven blinds that ALWAYS tugs at my heart. They filter light so beautifully and add so much texture. This looks like the perfect reading nook to me! 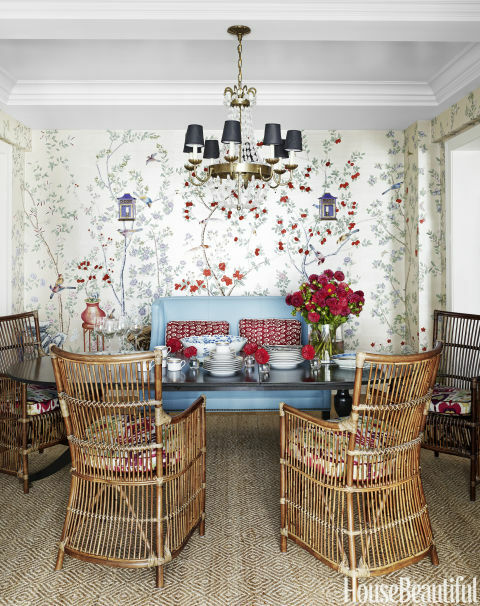 Those rattan armchairs are dynamite with the blue leather winged banquette in the dining room. 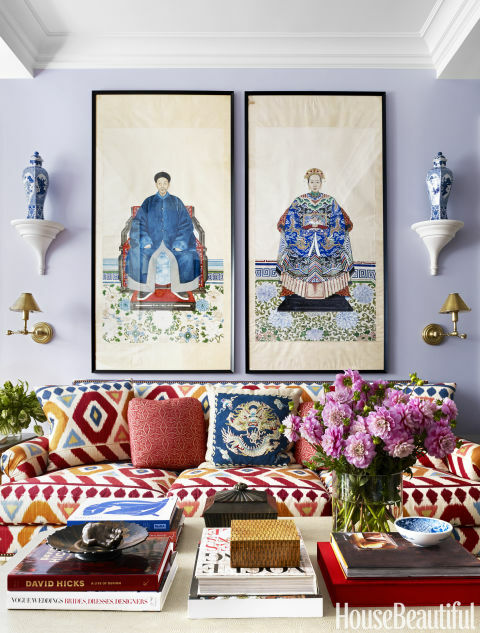 I love how blue-and-white Chinese garden stools are used throughout the space as side tables. It helps the different spaces relate. 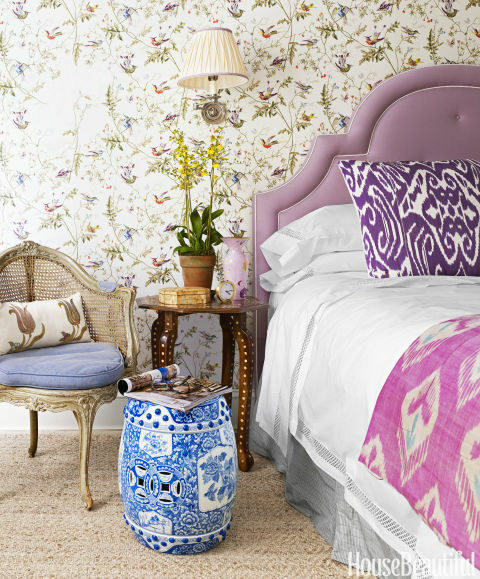 Lavender reappears in the master bedroom, but this time as the focus, to make for a soothing, relaxing space. 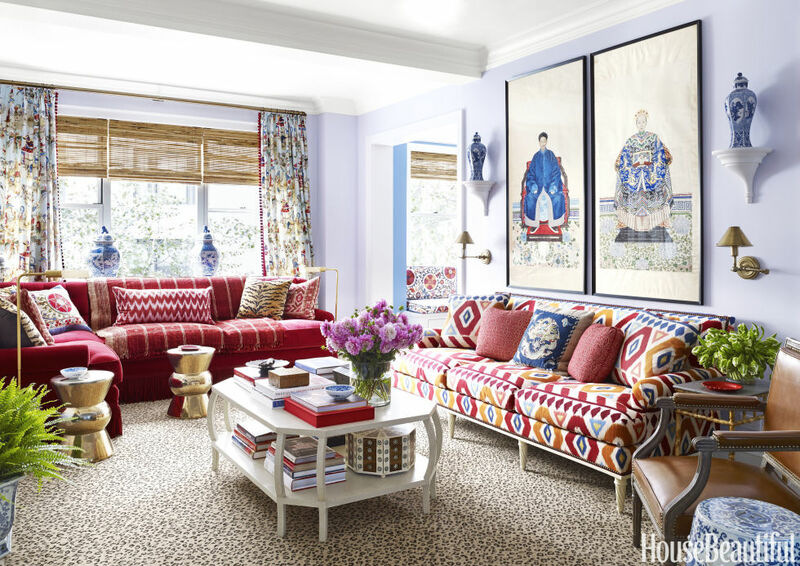 Get the full scoop on this bright and beautiful apartment and its designer by reading Alexandra Abramian’s interview, “The Secret to Making a No-Light Space Look Bright,” on the House Beautiful website, or pick up a copy of the September 2016 issue for your very own. 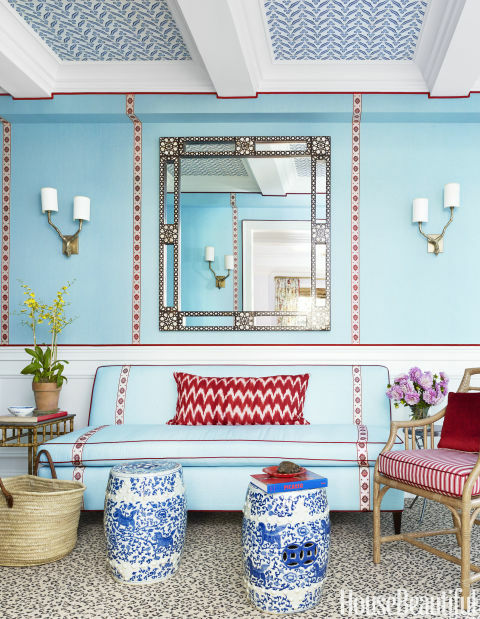 Check out Californian-based interior designer Mark D. Sikes’ portfolio. See more interiors photographed by Björn Wallander. Follow my blog with Bloglovin or get to-your-inbox posts using one of the subscription services below. Click on the affiliate link for details/purchase. Previous PostPrevious My Boho Heart Can’t DENY It: This Credenza is Home Decor JUNK!